LG Electronics referred ITSENCLOSURES to Diversified Media Group, an integrator for The Whitney Museum. Having worked with ITSENCLOSURES on previous projects, LG was very confident ITS could deliver an innovative enclosure in a short amount of time. With only a few months before the grand opening, Diversified Media Group, on behalf of The Whitney Museum, contacted the ITSENCLOSURES’ sales team to discuss the installation of an all-weather enclosure for a large-format, high bright LCD monitor. The enclosure would be utilized in an outdoor, deck area of the museum exposed to the extreme hot and cold temperatures of New York City. The Whitney Museum desired to install a large monitor on the outdoors of the museum. 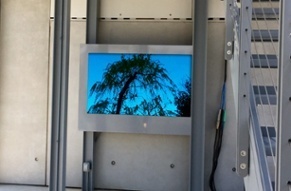 Therefore, the overall project required an all-weather lcd enclosure - with a high bright monitor - that would hang on a wall between two large pillars in an upper level exhibition terrace. Because of the New York weather, thermal management would also be a key component of the project. The monitor would display digital forms of art and other pertinent information for the museum, including upcoming events. One of the biggest challenges surrounding the project was to design and fabricate a custom enclosure with structural mounting constraints in a short amount of time. The size of the monitor was also an issue, because high bright monitors are not readily available in larger sizes, which was especially the case in the Spring of 2015. In addition, thermal management presented a unique challenge with the extreme temperatures in New York City and being so close to the Hudson River, there was a need for a specific heating/cooling solution to allow functionality year round. The design and enclosure components required an expedited delivery and installation for the innovative solution. The Whitney Museum made the decision to install a ViewStation all-weather LCD enclosure to protect an LG 72” monitor. 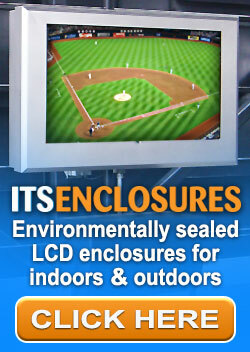 The durable enclosure assembly is constructed out of aluminum with a polyester powder paint finish. The enclosure includes laminated, anti-reflective glass, and is seamlessly suited for the environment near the Hudson River. The energy efficient enclosure assembly provides thermostatically controlled ambient air cooling/heating to the display, as well as a networked temperature monitoring capable of issuing email alerts triggered by ‘over the limit’ temperature readings. The ambient light sensor on the LCD and the temperature controlled heat and cooling system reduce the overall electric power consumption and provide the necessary operating environment for the display.